This technical case study addressing key and certificate security issues is designed for security conscious enterprises to understand real-life attack scenarios that threaten their businesses in today’s world. This white paper demonstrates a recent attack that used cryptographic keys and digital certificates as well as guidance on how to protect certificates and keys and quickly discover and remediate breaches. This paper should be read by more technical IT security staff who are interested in detailed attack methods and remediation tactics. The executive summary is intented for IT Security leaders (CISOs and their direct reports) and addresses the proof-of-concept attack impacts on the business. 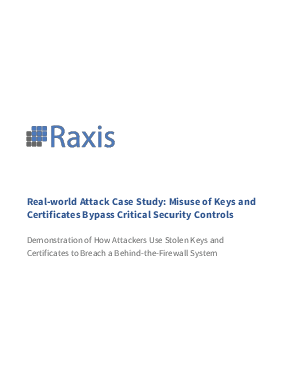 The attack scenario described in this technical white paper is based on a reproduction of a real-world attack in a Raxis test environment that simulated an enterprise security infrastructure.